A safe workplace helps reduce the long-term cost of workers compensation. 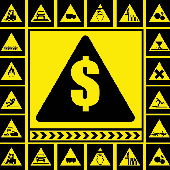 How do employers benefit from investing in safety programs and loss control? Workplace safety can be a pretty big deal when it comes to saving money on your workers' comp premiums. Employers who invest a little time and energy into a safety program are often rewarded with lower cost coverage because of their experience modification rating. A simple safety program that increases safety awareness via small incentives and education is often all it takes for success. Safety programs can vary tremendously in depth and scope depending on the size and nature of a business. Obviously, more dangerous and complex industries require more details and prevention measures than a smaller, low risk industry. However, the fundamental concepts are the same. A safety program can be as simple as creating a safety manual, establishing some safety rules, and executing incentives for workers. More complex industries may require additional layers to the program including training materials, OSHA compliance, MSDS Safety Data Sheets, and assigned responsibilities. Analyze and list any physical hazards in and around the workplace including entrances, walkways, electrical devices, fixtures, machinery, etc. Review workers' compensation Loss Runs to determine if and how prior injuries occurred. Identify and list risk associated with fires, chemicals, and company equipment. Consider and list any rules and procedures you would like to put in place for employees including personal safety equipment, dress attire, and specific steps to perform tasks safely. Get all the above information together and organized and determine who else (if anyone) will have responsibilities for the program. A safety manual for employees can be as simple as a Word document printed and stapled together. The important first step is creating one and updating it as your business grows or changes. Once you have your basic manual together provide copies to all employees and have them sign an acknowledgment form indicating they have received and will review the safety manual. As your safety program expands over time add all new policies, rules and resources to your Manual and hand out new material to existing employees. Once your safety program is organized and packaged into a Handbook, its time to put the program into action. The first step is to provide ongoing employee training and/or review of existing rules and policies. This can be as simple as choosing an existing topic and distributing a handout during a 10 minute monthly meeting. There are tons of resources available online for monthly or weekly meetings. Your current workers' compensation carrier likely has a free online library of topics and handouts readily available for your use. Examples include ladder safety, defensive driving, seat-belt policies, lock-out/tag-out, and equipment safety checklists. The final step to a successful safety program is to incentivize your employees on an ongoing basis. Safety incentives go a long way in influencing the overall culture of the company. Incentive plans don't need to break the bank. In fact, its actually better to keep incentives small and more frequent in the early stages of your program. Items you're likely give employees at some point anyway are good incentives. Examples include t-shirts, hats, logo apparel, office items, extra time-off, preferred parking, longer lunch hour, lottery tickets, mugs, or even points which accumulate towards larger rewards. An employee safety program is not as complicated as most employers anticipate. The best advice is to get started and the rest will come in time. Best of luck. Find your best price on workers comp. It takes 3 minutes. We're often surprised by how seldom businesses utilize the free safety resources provided by their insurance company. Many employers even get concerned when a carriers requests a loss control inspection prior to releasing a firm quote. The fact is a business can learn a lot from a loss control audit with little to no risk. Aside from a hands-on loss control inspection, most carriers have amassed a tremendous amount of free safety resources specifically designed for almost every industry segment. These resources include self-audits, turn-key programs, incentive plans, tips, training materials, and articles. Employers don't have to invest any money at all to take advantage of these free resources. As an agency, we've turned to our insurance companies for loss control inspections many times. What we've found is that most employers are initially skeptical about having their insurance company evaluating their workplace. They're often concerned that their rates will go up or they will get cancelled. Interestingly, they typically end up with great advice, an easy program to follow, and lower insurance rates at renewal. Consider talking to your insurance company about their free safety services and resources. Or give one of our Specialists a call to find out if your business might benefit from a safety program or loss control inspection. While safety programs are not a 100% guarantee that a business won't sustain an accident in the workplace. Multiple studies show that companies with safety programs out perform other companies in similar industries with regard to claims frequency and claim severity. We are happy to provide you with more information about our loss control services. Give one of our Specialists a call today at 888-611-7467 to see if your business qualifies for a free loss control inspection.